This is an easy breakfast casserole that you can whip up on a weekend morning for a delicious breakfast or brunch. Brandon had been asking me to make his aunt’s “breakfast pizza” for years. I’m not exaggerating. I finally gave in and had him describe it to me. It was definitely less pizza and more casserole. I did some research online and through a variety of sources came up with this. While I’m not sure if it’s an exact replica of “breakfast pizza” he enjoyed it and we’ll be making it again. Preheat oven to 400 degrees and prepare a 13 x 9 or 11 x 9 baking dish with cooking spray (use 6ish eggs if you’re using the 11 x 9 and 8ish if you’re using the 13 x 9). Line the prepared baking dish with unrolled crescent roll dough, letting it come up the sides a bit. Press together seams. Layer the crumbled bacon and cheese over the crescent dough. Beat eggs with milk, salt and pepper and pour over bacon and cheese. Bake for about 25-30 minutes or until the center is set. Let cool for a few minutes and then cut into squares and serve. So yummy! Thanks for the recipe. I fix this on my BGE in a CI skillet. I like to add sauteed onions to the cooked meat. I usually use sausage. I also add 2-3 tbls of black bean salsa. This gives it a spicy taste which we love. Kim – that sounds great! Thanks for the idea. We’ll have to give it a try. Your Grnadmother told me about your site and i can’t wait to try some of your recipies. Graham whipped this up this morning and it was tasty. It took a few more minutes for the eggs to set than the recipe suggested. By the time the middle was done the outside was overdone. We should have pulled it out a few minutes earlier. This was good, but I prefer a more traditional breakfast casserole with french bread. I’m sad that you didn’t love this. I recently learned that when cooking quiche/egg based dishes you should actually pull it out when it still jiggles a bit and let it rest out of the oven for 5 minutes. The eggs will continue cooking (similar to how meat and baked goods continue cooking out of the oven). So maybe that would have worked well in this case. *****10 STARS***** This one is absolutely perfect AND OH SO YUMMY!! I whipped this up for the first time this [Christmas] morning, and my family totally fell in love with it – they can’t stop raving about it. And it’s so simple to prepare, anyone can make it. It baked while we opened presents from Santa, and was done just in time for brunch. 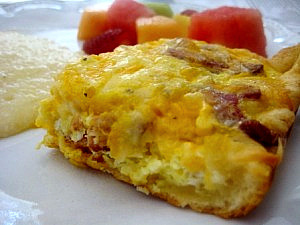 I used 10 eggs, a three cheddar cheese blend and a lbs of Jimmy Dean’s original sausage that I browned & drained first. It baked in a 13 x 9″ glass pan until it was done all the way through (and wasn’t overcooked at all). Thank you so much for making our Christmas brunch so MERRY. on April 2, 2011 at 5:51 pm | Reply Amanda M.
Would this work the same with just egg whites? Hi, Found this on Google – it looks amazing and I’d like to make it for mother’s day brunch! Do you think I can make it the night before, similar to the way you would with an egg casserole that uses bread on the bottom? Thanks for sharing the recipe! I have the same question – can I make this the night before and sit it in the fridge? thanks! I cant wait to try this recipe! Just what I have been looking for. Thank You! I see this is an old post but I made the recipe today and it was good! I added some chopped spinach and green onions to “health” it up a bit and add some greens.